Earlier this year, I realized that the number of unread books that I owned was getting a little out of control. Kelly from Belle of the Literati visited me at the end of April, and she manages her TBR like a boss. I mean, seriously, I want to be more like her! While she was here, I started to look at my shelves even more critically. Why did I buy so many books only to let them sit on my shelves? Something needed to change! The more I thought about it, the more convinced I was that I needed to press the reset button. I brainstormed ways to do it, and I came up with three strategies that I put into practice this summer. As the shift to fall begins, I thought it would be fun to reflect on what I did these past three months... and how it went! 1. I decided to do a one-month buying ban, and I think the specific and shorter time frame helped me complete it successfully. In the past, I've tried broader "no more new books until I catch up on what I own!" type bans, and those just don't work for me long term. I wish they did though! 2. I made Kelly my accountability partner because I knew she'd keep me on the straight and narrow. She literally wouldn't let me justify anything that I wanted to buy that month. It was a firm "NO!" every single time, no matter how hard I tried to convince her. 3. 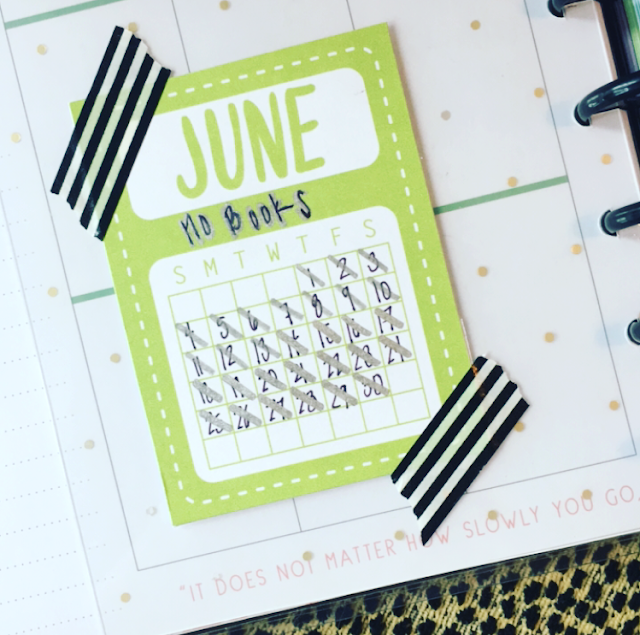 I tracked it on a printable habit tracker that I bought from a shop on Etsy. I taped it to a dashboard that I use in my Happy Planner so that I was looking at it every day. It helped keep me focused on my goal! While I'd love to stop buying books completely until I'm caught up on my TBR, I know that's not realistic for me. But this felt like the best of both worlds, and I could see myself doing it again in the future when I need to hit the pause button on my buying. It was the perfect way to kickstart this project! 1. I got my friends involved in my mission. I sent Kelly and Alexa a spreadsheet with my full TBR (physical, audio, Kindle and review) with one request: mark anything you think I should cull. If I couldn't really justify keeping a book they'd nixed, that told me something. If I was surprised they didn't mark a book, it was often because I'd expected them to confirm my gut feeling that it needed to go. If I wanted to immediately argue about a book they marked, it deserved to stay. I saw my TBR with new eyes! 2. I did multiple rounds (over several weeks) of culling. I started with the input of friends + my gut feelings, and then browsed through Goodreads reviews (low ratings? topics/keywords I dislike? etc.). Next, I checked the library to see if I could borrow something if I wanted to read it later. Finally, I sat down and read one chapter from each book. With every round, I dug deeper into my reasons for buying and keeping what's on my TBR. 3. I created a "cull from TBR but keep" pile for a handful of books. Typically, I try to make myself put any books I own but haven't read on my Goodreads "To Read" shelf. But that includes books I want to own but don't really plan on reading anytime soon (if ever), like pretty editions of certain classics. I may read them, but I own them more for looks or nostalgia than anything else. Now, my TBR reflects what I actually plan to read. "For my collection" gives me the freedom to buy new editions of books that I collect, and "from an author I love" allows me to buy stuff I haven't read before from a trusted author. "For a series I'm reading" specifically includes those last two words because I often buy an entire series before I've even started it. And finally, "that I've read and want to own" is probably my favorite reason to buy a book because it doesn't add to my TBR! I'll occasionally make exceptions, but it does help me approach book buying a little differently. Because a bargain is only a good deal if you're actually going to use/read something! I don't want to be the bookish version of the extreme couponer with a bunker of products I never would have bought if they weren't on sale. 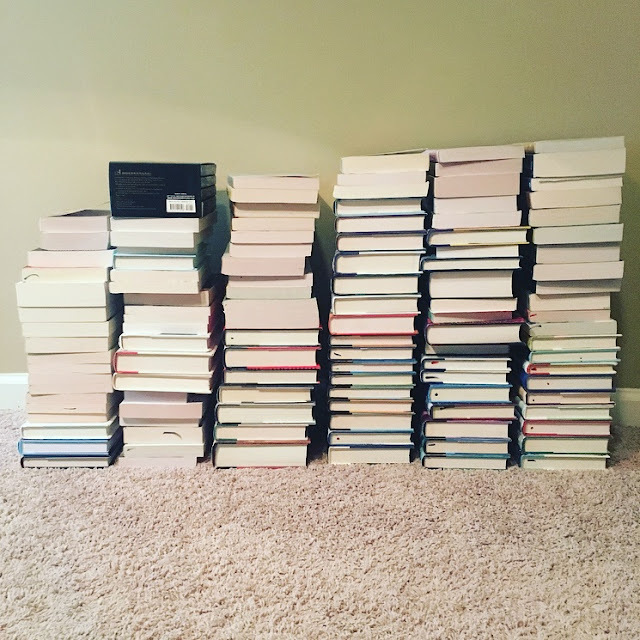 My first two strategies for tackling my TBR were things I've done before with varying levels of success. I used a few new principles that helped me stay on track more than I had in the past, but that's it. The third strategy, however, was the true gamechanger. And it's the real reason that I was inspired to write this post! 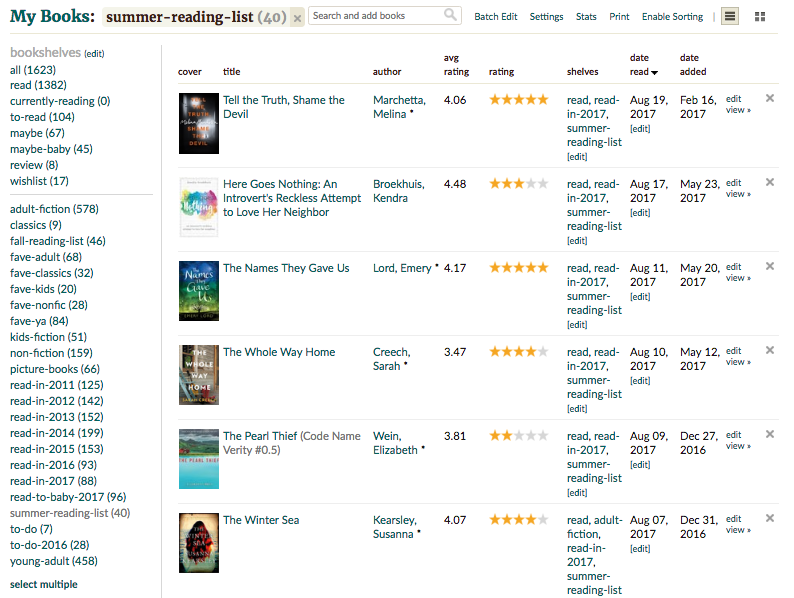 At the end of May, I created a Summer Reading List shelf on Goodreads. 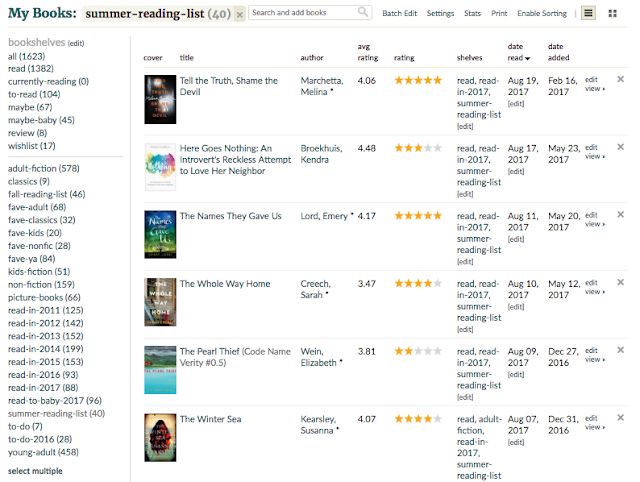 I went through my TBR and picked 40 books with one goal in mind: read as many books as possible from this list over the summer. I tried to choose a wide variety of options: fiction and non-fiction, Adult and Young Adult, older titles and newer releases, and multiple genres (with a bit more contemporary since that's what I'm drawn to in the summer). I didn't have to finish the list or exclusively read from it. But it would be my reference point when I thought, "What should I read next?" In my July 2017 recap, I included a blog post by Christine from Bucking Bookshelves entitled: "The appeal of limited choices... and the irony of my overflowing bookshelves." In the post, Christine shared how having a limited number of books available while on vacation helped her read from her own shelves. But, as you might expect, it was harder to keep the ball rolling once home and faced with stacks of unread books. I loved the post because it perfectly aligned with my little reading experiment. And Christine's discovery reflected what I found to be true this summer: having a smaller, curated reading list made it easier for me to tackle my TBR. The specific, limited list of books made it easier to choose what to read next and helped me focus on an achievable goal. The length of the list was long enough to give me options but short enough that it didn't overwhelm me. The variety on the list gave me something for almost every mood. And the fact that my goal wasn't to read everything on the list gave me enough freedom that I didn't feel pressured or obligated. In fact, it became a bit of a challenge. Although summer isn't officially over, I started reading from the list on June 1 with the intention of wrapping up by September 1. I wanted to spend three months with the list as my reading guide before checking on my progress. So, how did I do? I was so pleased with my results! I read 42 books total for June, July and August - and 64% of them came from my summer reading list. That's not to mention the fact that I read 7 other books from my TBR. If you add those to my two re-reads, 86% of what I read this summer was something I already owned. That's so much progress on my TBR! I can't remember the last time I read so heavily from my own shelves. In fact, I've decided to continue the challenge by creating a Fall Reading List. I've got a whole new set of books from my TBR, and I can't wait to see what I accomplish over the next several months. I carried over a few books from my summer reading list, but the majority is an entirely different selection. I have more fantasy and mystery, since those genres call to me in the fall. I included some new releases I've pre-ordered, a series or two I want to binge, and a handful of older titles I just haven't gotten around to yet. For the first time that I can remember, my Goodreads To Read shelf is below 100 books. It will probably be a while before it's at my ideal number of books, but I actually feel like I'm headed in the right direction. While I hope to continue to implement buying bans and TBR culls when they're necessary, I'm fully embracing the concept of Seasonal Reading Lists. It's a little soon to say for sure, but I think they're going to have a big impact on my TBR and my reading habits. Creating a list and checking off books was so much fun! Have you used a ban, a cull or a reading list before? What strategies do you use when your TBR is out of control? I love the idea of a one month book ban! That makes so much sense for jumpstarting a new habit and more realistic than longer bans. I'm so glad that post of mine helped you on your own reading experiment! This is such funny timing because over the weekend I kept pulling books off my shelf trying to figure out what I wanted on my "vacation bag TBR" for Fall -- and I keep saying to myself that I really need to do a post about them to keep me accountable! I've been trying to stick to the spirit of my "vacation" plan, but it's been pretty haphazard so far. Your organization is inspiring me! This is awesome! I've employed quite a few of these strategies over the past couple of years. My book buying was out of control before I started blogging but I've seriously cut back, to just about the same requirements you listed above. I don't usually buy books unless it's for my collection in some way or from an author I love. I used to impulse buy sale books ALL the time. I culled my TBR a lot before I moved. Woah, talk about good timing! I literally have a post scheduled to go up on Saturday talking about how my physical TBR has gotten too big for me and my plan to whittle it down. These are some great tips! I seriously love this post. I'm going to try something like it for the new year. My goal since I started blogging has been to reduce my goodreads tbr and it has only grown. I want to cull what books are on the list and really set a goal for the books I want to complete in 2018. These are some great ideas! I'm already on a pretty tight budget, so most of the time buying a book is just not an option. My library has a book rental section that has all the latest titles for $0.25/day. Not a bad trade off! This was so much fun to read through! Tackling my physical TBR is something I have an incredibly hard time with — I have so many older books I'd love to read but I'm too caught up in keeping up and reading new releases. I've given some books away, but I feel similarly to you — I can't give it up even if there's a small chance I *might* read it. How long did it take you to go through and read a chapter from all your "maybe" books?